Can Calories Burned During a 5K Justify a Big Meal? 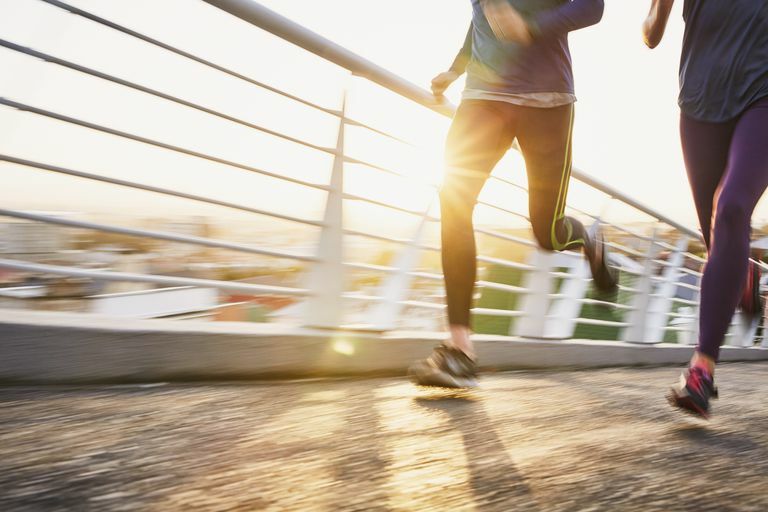 The number of calories you burn while running depends on a few different factors. For example, body weight makes a difference. A heavier runner will usually burn more calories than a lighter runner jogging at the same pace for the same amount of time. Speed can play a role, too. A faster runner may burn more calories than someone who is jogging at a slower pace if they run for the same amount of time. Gender can play a role as men often burn slightly more calories than women when performing similar tasks. And lastly, distance will usually change the numbers because it can determine the amount of time (duration) that your body is burning extra calories to run. So what does that mean for you? As a basic rule of thumb, you'll burn around 100 calories per mile, regardless of pace (because faster runners complete the same distance in less time). Running uphill will burn more calories than running on a flat surface. And other obstacles, like rough terrain (such as a trail run or running on the beach) may also affect the number of calories you burn. You can use this calculator to get a general idea of how many calories you burn running a mile. The exact number of calories you burn when you walk or run a 5k will depend on your body size and your gender. Weather conditions on the day of the race can make a difference, too. If it is windy, you'll have to work harder to get to the finish line. If you are running a ten minute-per-mile pace and you complete 3.1 miles (five kilometers), use these numbers to estimate the number of calories you would burn. Faster runners and slower runners would have similar caloric expenditures because the change in duration offsets the speed difference in most cases. To find out how many calories you burn during a 5K, use an online calculator and input your pace and body size. To boost your number, see if you can run a little bit faster or add a short warm-up jog and cool down walk after the event. You can use the 100/calorie per mile estimate to calculate the number of calories burned at longer running events. However, running form can deteriorate as you run longer distances. Your body gets tired and movement becomes less efficient. For that reason, you may burn more calories at longer events, such as a 10K, half marathon, or marathon. Can 5K Calories Burn Off a Cheat Meal? Many runners celebrate the end of a run with an indulgent brunch, happy hour, or a big family dinner. If you run an annual turkey trot race, you celebrate the end of your 5K race with a huge Thanksgiving dinner. But, is running a 5K enough activity to burn off the calories in a typical Thanksgiving dinner? In most cases, a single run won't burn enough calories to account for an indulgent dinner at a restaurant or a festive brunch with all the fixings. And it is not likely to burn off the calories in a Thanksgiving meal, either. Although the answer depends in part on the number of calories you eat during your meal. In most cases, however, you'd have to run several consecutive turkey trots to burn off the entire feast. For example, many experts estimate that you consume between 2500 and 4100 calories during a typical Thanksgiving meal. That meal would probably include high-calorie turkey with skin, full-fat mashed potatoes and gravy, several butter-drenched side dishes and, of course, one or two slices of pie with whipped cream. Even if you're able to burn 300 calories during a 5K run, you'd have to run 8 or more races to burn off those calories. But you don't have to eat that much. If you want to balance the calories in your Thanksgiving meal with the calories you burn during a 5K run or walk, you'll need to be mindful of portion sizes and food choices during the feast. You can cut calories in your Thanksgiving meal by using a few diet-friendly tricks during the holiday. For dessert, choose plain pumpkin pie. It's lower in calories than most other dessert choices. Keep in mind that even with these healthy choices, you will probably still eat more calories than you burn during a 5K run or walk. But that doesn't mean there isn't value in participating in the Turkey Trot. Running is a great way to improve strength in your lower body, improve your level of fitness and bond with friends and family. Participate in the run on Thanksgiving Day and then add a few extra walking sessions or short runs to your weekly workout schedule to keep your diet on track. How Many Steps Are There in a Mile? How Many Calories Do You Burn per Minute Walking? How Long Will It Take Me Run a 5K?